Cartoon Brew reports that a 'live action' marsupilami feature, On the Trail of the Marsupilami, is coming to France on April 4. The marsupilami (marsupial friend in French) was created by André Franquin in January 1952 as an incidental character in the long-running Belgian Spirou et Fantasio weekly comic strip. Although the marsu never took over Spirou et Fantasio, he became popular enough that fans complained when he was absent. When Franquin left Spirou et Fantasio in 1968, he took the marsupilami with him. Now there is the movie. Unfortunately, it looks pretty bad. The marsupilami only appears in the last two seconds of this trailer. Yeah, this movie snuck up out of nowhere; I hadn't heard anything about it being in the works! I've never read the original comics or watched the Disney series, but I did see one of the later comics Franquin did. It had the marsupilami with four babies, being extremely frustrated trying to untie their tails which had all bcome tangled together in a huge knot. But this movie looks really low-brow. I hope the lead actor finds better work; I really liked him as the grocer's assistant in Amelie. On the brighter side, there's a 2D French animated film being worked on, based on some kids' books - don't know much about it, but it looks charming! Ernest & Celestine - but it won't be out until December 2012 or early 2013, plus a delay until the DVD release. I am not familiar with Ernest & Celestine, either, but from the drawings of the bear & mouse, it certainly does look charming! I will await this with all the eagerness that I don't have for "Houba! On the Trail of the Marsupilami". 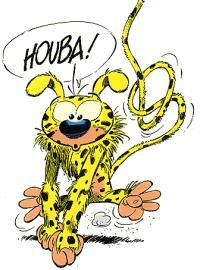 I do recommend the original marsupilami cartoon-art books by Franquin, though (to those who read French). None of the names sound familiar but that character does seem familiar. I'm not sure where I saw it though. Heh, no. It must have been on TV. If it was a show that I watched often I would've remembered though. Probably just saw it a few times when going through channels. The voice reminds me of Um Bongo. Ugh! Um Bongo is better than Disney's animated Marsupilami. The Marsupilami stories were set in the South American jungles. Disney added a gorilla and an elephant to the cast. As almost all the critics pointed out, gorillas and elephants are not South American wild animals. "This would never have happened if Walt Disney were still alive!"